Scuba divers’ underwater egg and spoon ‘Olympics’ raises cash for Sport Relief | News by Wales Express News, People Before Profit! 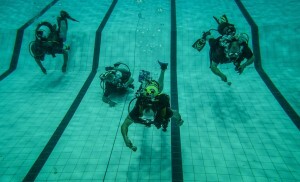 Members of Flintshire Sub Aqua Club, a branch of the British Sub Aqua-Club (BSAC), taking part in the underwater egg and spoon race. Scuba divers have raised a pool of cash for Sport Relief after competing in their own whacky underwater triathlon. Members of Flintshire Sub Aqua Club, a branch of the British Sub Aqua-Club (BSAC), staged a series of sponsored underwater relay events including an egg-and-spoon race, sack race, and three legged race. Five teams made up of four divers took part in the event at the club’s Holywell pool to raise funds for the BBC’s Sport Relief charity. Dave Skyner, Flintshire Sub Aqua Club’s secretary and welfare officer says club members wanted to support what they believe is a wonderful charity. They decided to do something fun to raise as much cash as possible, and came up with the idea of an Olympics inspired underwater triathlon. The divers have spent the last few weeks practicing to get their technique right, using ceramic eggs instead of real ones to avoid any breakages in the pool. Dave said: “It’s not easy trying to run underwater especially balancing an egg on a spoon. “It means divers have to use a lot more weight so they are negatively buoyant and we couldn’t use actual eggs just in case they broke and contaminated the water. “The sack race was anything but easy but was a lot of fun and the three legged race involved divers having their legs fastened together but they were allowed to use fins on their free leg. “It was definitely hard work but a lot of fun, and everyone had a great time raising money for what is a really worthwhile cause. He added: “We’ve raised more than £380 so far and more is still coming in, so hopefully once we get all the sponsor money in we will have raised a great deal more. It’s a fantastic charity and something the club members wanted to support. BSAC is the national governing body for scuba diving and is made up of 120 dive centres and 1,000 plus family friendly and sociable clubs, run by volunteers, up and down the country and abroad. The Duke of Cambridge is the club’s President. BSAC Chief Executive, Mary Tetley, said: “It never ceases to amaze me the amount of charity cash that is raised each and every year by BSAC divers right around the country. “Sport Relief is a fantastic cause and I know how much fun the Flintshire Sub-Aqua Club members had raising much-needed money for this special charity. “BSAC divers are, by nature, socially responsible whether they are raising funds for good causes or protecting our marine environment for future generations. “Anyone interested in finding out more about diving and what the sport can offer should visit our website or get in touch with any one of our branches. It’s a fantastic and an exciting sport. Dave, a BSAC Advanced Diver and Open Water Instructor, says Flintshire Sub Aqua Club has more than 55 active members of which around 15 are women. He said: “It’s a great club. We train on Wednesday evenings at Holywell Leisure Centre which has a fantastic pool and facilities. “We run theory sessions between 7pm and 8pm and then have pool sessions between 8.30 and 9.30pm. “We’d like to attract more lady divers if we could. We have members from all walks of life. “We have dentists, teachers, accountants, paramedics and probation officers. It’s a friendly club and we have a very active dive calendar. “We are out most weekends right throughout the year. We dive right along the North Wales coast as well as running trips to places like Plymouth, Scapa Flow and the Farne Islands. Dave says the club is always happy to take potential new members for a try dive which costs just £10. He said: “The club has all the equipment needed to train new divers although once new divers qualify they are expected to use their own equipment. “The £10 fee covers a theory session and an hour in the pool with an instructor. And everyone gets BSAC’s Go Diving pack which includes a DVD. For more information about BSAC go to www.bsac.com or follow the organisation on Facebook or Twitter @BSACDIVERS.